(Bloomberg) -- Prepare for the return of the divergence trade, with the U.S. set to outshine the rest of the world. In the wake of political turmoil in Italy, violent street protests in France and sluggish growth in Germany, the European Commission recently slashed forecasts for the region’s economic expansion to 1.3 percent this year, down from 1.9 percent projected in November. While U.S. activity is expected to slow from 2018’s pace, the Federal Reserve still projects a solid 2.3 percent increase for gross domestic product. 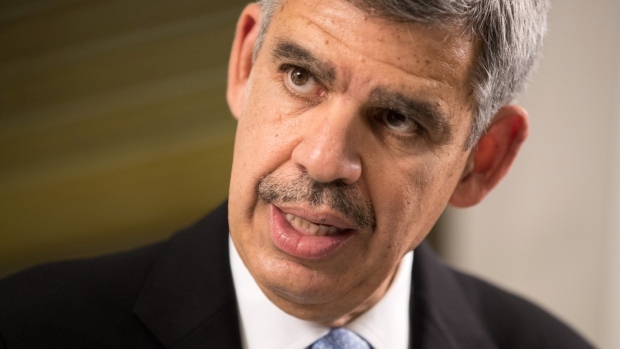 El-Erian is a fan of the New York Jets, so rest assured he knows a thing or two about bad teams. Given the outlook, the “obvious relative trade’’ is to go long U.S. stocks versus the rest of the world, El-Erian advised. He also called for the spread between 10-year U.S. Treasuries and German bunds to widen out to as much as 270 to 280 basis points, from the current 255 points. Within the European fixed-income universe, he suggests paying more for higher quality debt. Staying away from the most at-risk countries is also judicious, he added, saying investors “stretched for yield’’ in lapping up recent issues from the likes of Italy and Greece. Europe is “a lot more” concerning than China, he concluded.